I will readily admit that I'm not a regular reader of contemporary fiction - it just isn't my genre. That being said, I completely adore survival stories, regardless of the setting. 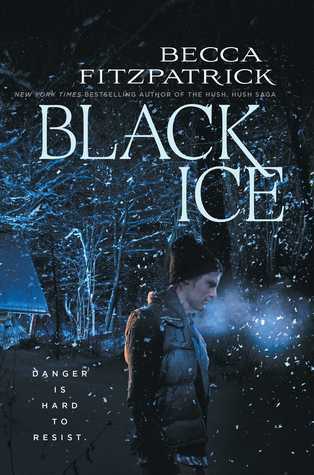 Black Ice promised to be a riveting survival story set in the mountains during a snowstorm with some romance thrown in for good measure (okay, it promises a lot of romance). I had high hopes for this one. I've rarely met a survival story I haven't loved! Britt and Korbie are best friends (apparently) and Britt has recently had her heart broken by Calvin, Korbie's brother. Normal enough so far, right? Well, that's where the normalcy kind of ends. Calvin dumped Britt via text EIGHT months ago, but she isn't over him even a little bit. While all of their friends are going off to Hawaii for Spring Break, Britt decides to drag her BFF on a 40 mile hiking trip in the off chance they'll run into her ex. Because that's a normal thing that people do. As you can see from the blurb, she never quite makes it, instead finding herself stranded. That's where the REALLY stupid part begins. These girls are utterly clueless about life in general. Britt goes on and on and on throughout the book about how she has depended on the men around her to save her for her entire life, and I didn't doubt her for a second. When they're snowed into their car, they decide to leave it. They leave the car. The car with a heater and blankets and supplies and food. They.Leave.The.Car. And it gets better! They stomp around in a blizzard until they find a couple strange men and just hop on into their cabin. Because that's a normal thing people do. Totally surprisingly, they're taken hostage. Korbie runs her mouth a lot and almost gets herself killed because she's a genius and thinks the entire world revolves around her. Thankfully, Korbie isn't a huge part of the story and instead we get to focus on the romance. Oh, joy. I'm going to be honest, the romance made me a little uncomfortable. It's total Stockholm Syndrome (but maybe not because he was nice that one time). Britt does her darndest to convince herself that it isn't, but it is. And it's annoying to watch her bounce back and forth between Calvin and Mason through the entire book. The story itself is... interesting. There were some really good thrilling moments where I truly had to hold my breath. The setting is pretty great. I actually felt cold at times and had to bring myself back to the present! There was even a pretty good twist near the end that I kind of but not really saw coming. But ultimately the big reveal and all the convenient explanations fell flat for me. I didn't sympathize with Britt at all. She was helpless and stupid and constantly made excuses for everyone. I didn't think Mason was all that intelligent, despite being hit over the head with what a genius he was on every other page. Black Ice was just not what I'd hoped for at all. I've read some really amazing YA and NA survival stories that included romance and this one just didn't work. Sometimes Stockholm Syndrome works (hey, I love Beauty and the Beast!) but in this case it was just uncomfortable. I hated almost every single character, with the exception of Mason, who I only mildly disliked. Still, it did have a few good moments and some pretty amazing world building to have been set in the middle of the woods. All in all I don't think I could recommend it unless you love totally unrealistic and cheesy Stockholm Syndrome romance novels.